As you know, in very old times people had no books. They could not. read or write. In their free time they gathered together to tell stories and sing songs. At that time there were men who walked about the country, and stopped now at one place, now at another.3 They sang long songs about great heroes and great events. These men were called «bards». People loved to listen to their songs and stories. Later, when some of the people learned to read and write, they wrote down many of these songs. One of them-was The Song of Beowulf, which tells about a brave and strong hero who fought for the good of the people. A long, long time ago the king of Denmark was Hrothgar. He was brave, just and kind his people loved him. He built a large and beautiful palace for himself and his warriors. Men came from all parts of the country to look at the fine palace. Every evening many people gathered in the palace, and they ate and drank, told stories and sang songs, danced and laughed. Not far from the palace there was a large lake. A great monster lived in that lake. His name was Grendel. Grendel heard the singing and laughing in Hrothgar’s palace every evening and did not like it. He was lonely in his lake and he was very angry with the warriors because they were making merry. He got more and more angry every day. Late one night Grendel got out of his lake and went to Hrothgar’s palace. He soon came near it. It was still and dark inside, and Grendel went in. There were many warriors in the palace, but they were all asleep. Grendel killed one of the warriors and drank his blood. Then he killed another warrior and drank his blood, too. That night the monster killed thirty warriors and drank their blood. Then he took the bodies of the dead men and went back to his lake. The next night Grendel came to the palace again. Again he killed thirty warriors, drank their blood and carried their dead bodies into the lake. Night after night, month after month; winter after winter the terrible monster came to the palace and killed men. There was no laughing and singing now. The bravest and strongest warriors could do nothing against him. Their spears, arrows and swords could not kill Grendel. This went on for twelve years. On the other side of the sea was the country of the Geats. There was a young man among the Geats whose name was Beowulf. He was very brave and strong. He was the strongest man in the whole country. He was stronger than thirty men. One day he heard about the terrible monster Grendel, who killed thirty warriors every night in Denmark. Beowulf wanted to help King Hrothgar. He found fourteen strong, brave warriors among his friends, got on a ship with them and sailed off across the sea. They sailed the whole night, and in the morning they came to Denmark. When they got off the ship, they saw a man on a horse. He was one of King Hrothgar’s warriors. «Who are you and what are you doing here?» he asked them. The warrior took Beowulf and his friends to Hrothgar’s palace. King Hrothgar smiled when he saw the Geats. Night came. Everybody left the palace. Only Beowulf and his friends stayed in the palace. Beowulf told his fourteen friends to lie down and sleep. He himself waited for Grendel in the dark. Grendel appeared in the middle of the night. He quickly entered the palace, killed one of the sleeping warriors and began to drink his blood, as he always did. But at that moment he saw Beowulf, and a terrible fight began. They fought for a long time. Grendel was very strong, but Beowulf was stronger. He tore off its arm. When Grendel received a fatal wound and howled. He ran out of the palace back to his lake and died there. In the morning King Hrothgar and his men came to the palace. They looked with great surprise at Grendel’s arm, which was hanging from the ceiling in the middle of the palace. Then they went to the lake. The water of the lake was red with Grendel’s blood. People from all parts of the country came to look at Beowulf and thank him. Everybody was very glad. Till late at night they talked, sang and laughed in the palace as before. At night everybody went to sleep. But the troubles of Hrothgar and his men were not over. An ugly witch came out of the lake and quickly ran to the palace. She was Grendel’s mother. She ran into the palace, caught one of the warriors, killed him and carried him to the lake. «I ask you to help me once more, brave Beowulf,» said Hrothgar. They got on their horses and rode to the lake. When they reached it, they saw that the lake was not quiet and its water was black. They waited. It became cold and dark. The witch did not appear. The warriors did not know what to do. Then Beowulf got off his horse and jumped into the lake. When his feet touched the bottom, the witch sprang on him and tried to kill him but she could not. Then Beowulf saw the witch’s cave and ran into it. And here he was very surprised. There was no water in the cave. In the middle of the floor there was a bright fire. In the light of the fire he saw the dead body of Grendel in a corner of the cave and a sword on the wall. He quickly took the sword and killed the witch with it. Then Beowulf took the magic sword and came out of the lake. His friends were happy to see him alive. In the palace Beowulf told King Hrothgar and his warriors about his fight with the witch. King Hrothgar thanked Beowulf many times and gave him and his men a lot of presents. When Beowulf and his friends were going home, many people came to say good-bye to him and to thank him again and again. Why was Grendel angry with the warriors? Find sentences in the text to show how strong Beowulf was. How did Beowulf kill Grendel? 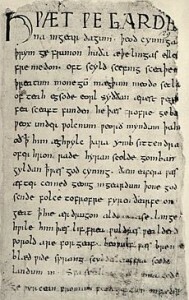 Describe in detail the fight of Beowulf and the witch. 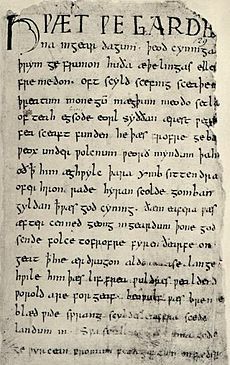 Why did people write The Song of Beowulf, in your opinion? What heroes of Russian literature can you compare Beo­wulf with? Why? Читать еще произведения английской литературы, адаптированные и в оригинале.